God's Best Gift: just a thought..
after bloghopping to some of my favorite blogsite, I notice that everyone seems to have a post about father's day and I on the other hand have none from both of my blogs. so this maybe a bit late but still I wanted to post about the 2 most important men in my life. he is yet to be a father, but witnessing how he love his family, I know he'll be good dad, seeing him how he take good care of his pet and of course me..there is no doubt that he'll be a wonderful father to our would be children..and can I just say he love kids so much? 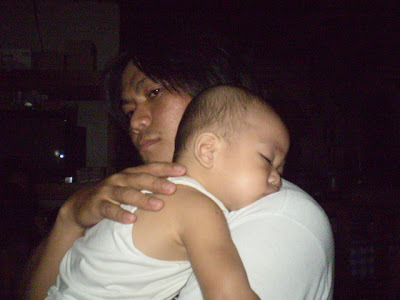 I am witness to how he served to urban poor kids in Maricaban,Pasay City, even when we were not married yet, he loved every single kid no matter how dirty they are, how bad their odors are, he will just hug them when they come to him. I am so blessed to have him to be the father of our future kids.